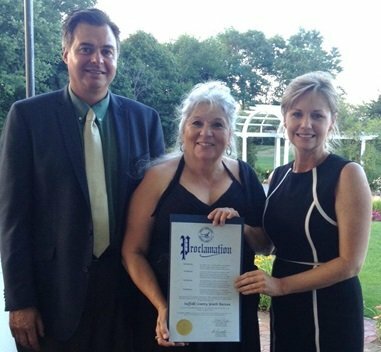 Aquebogue, NY - August 21, 2015 - On Thursday, August 20th, Suffolk County Legislators Sarah Anker and Al Krupski attended the Guidance Center’s Starfish Ball. The event was held at The Vineyard in Aquebogue and raised funds for Guidance Center programs that work to strengthen families through prevention education. The event included a dinner, raffles, an award ceremony, and music. At the event, the Guidance Center honored the Suffolk County Youth Bureau. Legislators Anker and Krupski helped to honor the Suffolk County Youth Bureau with a proclamation. The Bureau was created in 1979 as an entity within the Office of the Suffolk County Executive. Its mission is to successfully meet the needs of Suffolk County youth by ensuring effective countywide planning, thoughtful development, and efficiency in the management of resources necessary to sustain the County’s youth service system. The Guidance Center is located in Southold and works to improve the well-being of people of all ages within the community through prevention education and other effective programing. For more information about the Guidance Center, please call (631) 664-9886. Subject: LongIsland.com - Your Name sent you Article details of "Legislators Anker and Krupski Honor the Suffolk County Youth Bureau at the Starfish Ball"